Wanted to share a few photos from the past two weeks of HalloWeekends. Heat grill to medium. In a medium skillet on medium heat melt butter. Add garlic and cook 1 minute, until golden and just beginning to give off an aroma. Add lemon zest and juice; heat 1 minute. Keep it on side of grill to keep warm. On eight 12-inch skewers thread shrimp, bread, squash, and zucchini. Brush with oil and sprinkle with salt and pepper. Cook 5 to 7 minutes, turning once, or until shrimp is cooked through. Add parsley to butter sauce. Serve shrimp with sauce. Enjoy! We’re in what I’m calling the home stretch on the construction of our new office! With just a few more items like carpeting and touch up painting we’ll be ready to move in. Our move in date is now October 15 … not too far away. Below are a few more recent photos. 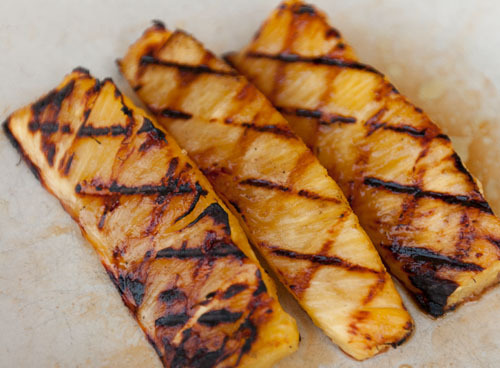 Grilling pineapple makes it even sweeter than fresh pineapple so you’re in for a treat! Slice the pineapple into 10 spears by cutting down the length of the fruit. Slide each spear onto a wooden skewer, pushing the stick halfway into the piece of fruit. Grill on a low-flame. Place fruit at the front edge of the barbecue so the skewers are off the grill. Grill about 2 minutes per side. Transfer pineapple to serving plates. Drizzle with caramel sauce and sprinkle with flaked coconut, if using. We want you to have a blast during your your family camping experience, but we also want you to be safe out there. A nice campfire is a wonderful part of camping. But … it can be dangerous if not handled properly. When you’re building and cooking over your campfire make sure that no loose clothing is near the fire and make sure hair is tied back. Don’t use accelerants, like lighter fluid. Make sure that your kiddos are careful around the fire … no running and playing. Always have a bucket of water on hand to put out any wayward flames. Watch your small kiddos around this bucket since it does pose a drowning hazard. Always make sure that you completely extinguish the fire. Always carry a basic first aid kit. This site gives a good list of suggestions of items that should be included in your kit. However, you should personalize your kit to your own needs. Especially if you have certain health problems, etc. It’s also a good idea to take CPR/First Aid Training before your trip. Sunburns, scrapes and blisters are the most common ailments while camping. Spend a little time on prevention and you’ll avoid these nuisances. Apply sunscreen, wear protective clothing like hats and long sleeves, look for areas that will provide a soft landing, such as grass or sand, for active games; and and wear proper-fitting shoes and socks. Never approach wild animals. They may look cute and harmless, but they can be very unpredictable, as well as territorial and protective. In most cases, the animals are more afraid of us and will run away. Do not attempt to feed wild animals. Look out for snakes, spiders and other critters. If you’re hiking, watch where you are walking and always be careful when picking up sticks or rocks. Look around the area before you pick a spot to sit down. Other insects such as bees, ants, ticks, mosquitoes, flies are not to be taken lightly. They can be annoying and also cause quite a bit of pain and discomfort. Lots of people have severe allergic reactions to their bites and need to carry necessary medical supplies or seek medical attention. Wear sunscreen and sunglasses. You can get sunburn in a very short period of time even on overcast days. Protect your eyes from the strong ultraviolet rays of the sun and reduce glare from off the water or off the snow. Sunburn can ruin any vacation. If you go hiking; never hike alone … go with a friend and tell someone about your plans and proposed route. Take plenty of water, snacks, matches and a flashlight. Don’t forget your compass and trail maps; and maybe even a GPS. Be aware of the weather. Supervise your kiddos. Tell them to stay within your sight and don’t let them wander off. Keep a picture of your children with you just in case they get lost. Always pay attention to weather conditions. It can change very quickly. Be prepared and act in anticipation of severe weather. Check with the campground that you’re staying at about their security and severe weather policies. Just use common sense and always be prepared. If you have some helpful tips you’d like to add them in the comments! We’d love to hear from you. Foil fries are on the menu for Rudy’s Recipe this week. Rudolph loves French fries! Spray a large piece of foil with non-stick spray and liberally add cheese. Place the potatoes in center of foil. You can add any seasoning on top like salt, pepper, cajun, etc. Close the foil tightly and roast over campfire or stove for 45 minutes. Yum, yum! Are you and your family visiting us this weekend? Here are the hours for our amenities! As always, they are subject to change. Celebrate HalloWeekends with us at Lake Rudolph and be part of wizards, magic, potions and fun! With HalloWeekends just a little over a week away we’ve been busy finalizing the activity schedule, organizing the new T-shirts in the Camp Store and lots more. We hope everyone is as excited as we are … this is one of our favorite times of the year! In case you haven’t seen it just yet, the new HalloWeekends T-Shirt design features Rudolph the Red-Nosed Wizard. I think Rudy makes a very handsome wizard! These shirts are sport grey, high quality pre-shrunk 100% cotton, available in long and short sleeve. They’re available for purchase in the Camp Store. Adult, Youth, and Toddler sizes are available. Prices are affordable for the family; $11.95 and $13.95 each plus tax. If you’re curious about this year’s activity schedule you can view and download a copy here. There have been a few time changes so make sure you take note of those. We feature activities like haunted hay rides, bonfire ghost stories, site decorating and costume contests, and much more. Below are photos from last year. We still have limited openings for the 1st and 2nd HalloWeekends in September; September 17 & 18 and September 24 & 25. You can reserve online or call reservations at 1-877-478-3657 and they’d be glad to help. This Friday for Rudy’s Recipes I thought I’d share a video from MetaCafe that teaches you have to make various campfire desserts. The first one, is one we’ve featured a recipe on but we call them Banana Boats … and they’re delicious! If you’re staying with us this Labor Day weekend, try out some of these! And let us know how they turn out.